The first movement with title Recitative is really a theme with variations in a very free form. Notturno: a fully notated cadenza for percussion seeks to evoke the impression of a summer night; a lonely melody for oboe supported by sparse chords in the piano sets the mood in the middle section, which leads back into the atmosphere of the beginning. Danza: progressions with strongly rhythmical elements - superposition of metrical layers - give the movement a dance-like character. In Ludi a tre, op. 29, I have tried for the first time to treat percussion instruments as partners in chamber music with equal rights. I was encouraged to write this work - like most of my work for percussion - by Siegfried Fink. It was composed and premièred in Nuremberg in 1965. An atmospheric Notturno is set in the frame of a striking Recitative and a turbulent round dance with the title Danza. 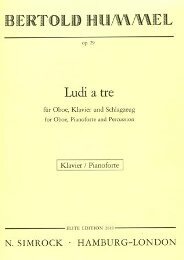 Bertold Hummel's "Ludi a tre" indulged for the first two movements in strange under-water sounds, until oboe, percussion and piano got a lively bar atmosphere going in the Finale. The jazz finale seems to be in fashion: two movements long the puzzles of the world are brooded on, and at the end, when the ranks are a little broken, one shows that one likes company.